New Era strives to provide its customers with top notch turnkey services. We understand how important it is to get your equipment up and running in a timely, yet orderly fashion. 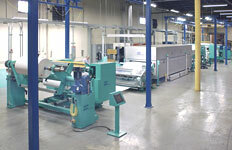 the installation of the web line in the facility of its customer. drawings and information for the equipment. All skidding, loading and shipping of the equipment is handled by New Era. New Era then handles the site receipt, mechanical installation, wiring, and piping of the supplied equipment. New Era will furnish all labor, materials, supplies, equipment and other items necessary to install the machinery at the customer’s facility. After the installation, we provide personnel to accomplish the startup and commissioning of the equipment.